I was working with some complicated generics system, and I found the need to make an abstraction for a typesafe mapping between K[T] and V[T] where T is the same for individual pairs. In the case where the key or the value is T itself, we use a trick: type Identity[T] = T, and set the parameter to Identity. I have provided type aliases to make this usage more clear. And store your entities in an Identified[EntityID, Entity]. Then, if you have, say an EntityID[Cow], you can pass it to the map and get your Cow. It's been a couple of months so maybe you've moved on, but I had a look through this today. I also may have read too much into your example use case, so apologies if this isn't helpful. If like in your example we can restrict the scope down to cases where K is covariant, and we can also remove the higher-kindedness of the value type, then we can improve the type safety significantly. So much so that we can escape all of the asInstanceOf calls! val map: TypeMatchingMap[K, V, Int] = ??? val k: K[String] = ??? We know that the last line won't ever do anything useful, so in my mind it would be kinder to prevent it from compiling so as to prevent any client of the API from making a mistake. Happy to discuss the code more, but didn't want to go into too much detail if you're no longer interested. Not the answer you're looking for? Browse other questions tagged scala generics collections type-safety or ask your own question. 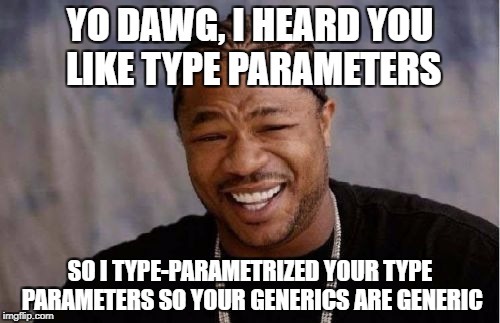 Is there a better way of defining generic entity classes?